Caleb Swanigan was originally part of Tom Izzo's recruiting class at Michigan State before switching to Purdue. How the Top 25 recruits will fit in as freshmen: UConn's Jalen Adams, Villanova's Jalen Brunson, Arizona's Ray Smith, Florida State's Dwayne Bacon and Purdue's Caleb Swanigan. UConn received a verbal commitment from one point guard who hails from Roxbury, Mass., less than a week after another Huskies point guard from the same neighborhood, Shabazz Napier, was selected in the first round of the 2014 NBA draft. It’s not surprising that Adams is frequently compared to Napier, who led UConn to a national championship in '14, but Adams said last December that while he admires what Napier accomplished during his time in Storrs, Conn., he does not want to be remembered as “the kid who followed Shabazz,” according to the Hartford Courant. One difference is that Adams, who played his senior season at prep powerhouse Brewster (N.H.) Academy after transferring from Cushing (Mass.) Academy, is far more highly regarded than Napier was coming out of high school. (Napier checked in at No. 75 in the final version of the 2010 RSCI.) Unlike Napier, who bided his time behind Kemba Walker as a freshman, Adams seemed poised to become UConn’s primary point guard right away. That changed when the Huskies landed Seton Hall graduate transfer Sterling Gibbs in May. Adams should still get plenty of run as a freshman, and two-point guard lineups featuring him and Gibbs could pose matchup issues for opponents. While the addition of Gibbs likely will diminish Adams’s shot creation and ball-handling responsibilities, he could thrive both alongside Gibbs and on his own. A different school based in Philadelphia, Temple, was once considered the favorite to land Brunson. He had named the Owls in his final list of eight schools, and they reportedly were set to hire Brunson’s father—Rick, a former Temple guard—as an assistant. Then Rick Brunson was indicted on multiple charges following an incident in which he allegedly attempted to sexually assault a massage therapist (he was acquitted of the charges in May), and Temple hired Aaron McKie instead. Jalen Brunson later narrowed his list to Illinois and Villanova before committing to the Wildcats last September. While Villanova has produced a collection of talented guards during coach Jay Wright’s tenure, Brunson is one of the most highly regarded prospects to sign on in Wright's 14 years at the school. The Wildcats had not landed a guard ranked in the top 20 of the RSCI since St. Anthony (N.J.) High product Dominic Cheek (19) in 2009. As a senior, Brunson averaged 23.3 points, 5.3 assists, 4.7 rebounds and 2.6 steals while leading Stevenson (Ill.) High to a state championship and being named Mr. Basketball in Illinois. Most recently, Brunson averaged 14 points and 5.6 assists per game and was named Most Valuable Player of the FIBA U19 World Championship. The 6'2", 190-pounder has drawn praise for his ball-handling, passing and feel for the game. “When it's all said and done, it won't be a surprise if the Villanova-bound point guard ends up one of the most prolific scoring and highly decorated collegians from the class of 2015,” wrote Rivals.com analyst Eric Bossi. Though Villanova brings back co-Big East player of the year Ryan Arcidiacono, Wright has proven adept at deploying multiple ball handlers to great effect. With Brunson coming in and Arcidacono returning alongside sophomore Phil Booth and junior Josh Hart, the Wildcats’ perimeter rotation shouldn’t falter even though it lost Darrun Hilliard and Dylan Ennis off last season’s 33-win team. Smith also tried to ease Arizona fans’ nerves by posting a video to his Twitter account in which he says, “If you’re wondering how my leg’s doing, I got you,” before throwing down a one-handed jam. The apparent progress Smith has made in his rehabilitation is encouraging for the Wildcats considering they must replace two first-round draft picks off a team that won 34 games, earned a No. 2 seed in the NCAA tournament and reached the Elite Eight last season. The upside for Florida State fans who watched their favorite team slink to a ninth-place finish in the ACC and post its lowest win total (17) in a decade last season was the recruiting class coach Leonard Hamilton assembled—and kept together—for 2015-16. In a three-week stretch beginning last August, the Seminoles secured verbal commitments from four-star small forward Terance Mann, ranked No. 98 in the Rivals150; four-star shooting guard Malik Beasley (No. 43); and Bacon (No. 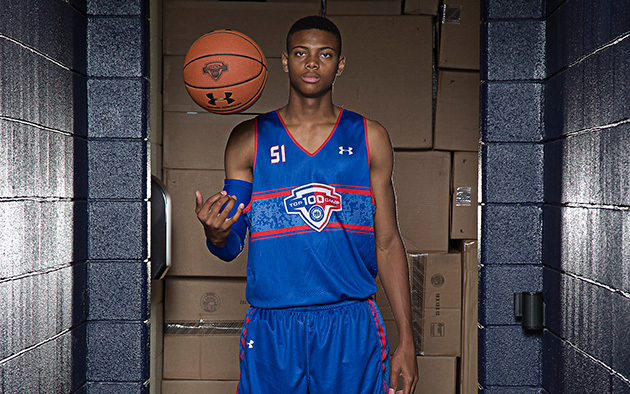 22), an athletic wing who’s considered one of the top scorers in the class of 2015. As a high school senior, Bacon averaged 24.4 points, 4.4 rebounds, 3.4 assists and 2.2 steals, helped powerhouse Oak Hill (Va.) Academy to a 45-0 record in the regular season and was named Virginia’s Gatorade player of the year. The Lakeland, Fla., native also had previous stints at IMG (Fla.) Academy and McKeel (Fla.) Academy, during which he became known as a volume scorer. For the Seminoles’ sake, hopefully that reputation fades because they can’t abide more poor shot selection after ranking 163rd in the nation last season in adjusted offensive efficiency and 107th in effective field goal percentage, according to kenpom.com. In any case, Bacon's ability to maneuver around defenders in the half court, then slash to the basket and score in transition should elevate a Florida State attack that brings back six of its top seven scorers, including All-ACC honorable mention guard Xavier Rathan-Mayes. The 6'6", 210-pound Bacon is viewed as one of the more seasoned prospects in this class in part because of his physicality and age (he turns 20 next month). “The upside is that he shouldn't have any issues with strength in the ACC, it's just going to be a test of his skill level,” wrote Bossi. Even if Bacon underwhelms as a scorer, he and Beasley could produce one of the best freshmen-focused dunk mixtapes in recent memory. In April, Swanigan surprised many observers when he committed to Michigan State instead of Cal, a decision that made the five-star center the highest-ranked prospect to commit to the one of the Big Ten’s top incoming recruiting classes. Less than a month later, Swanigan had reneged on his pledge to the Spartans and announced his commitment to Purdue. Swanigan’s dalliance with Michigan State—which began with him proclaiming on Twitter, “Once a Spartan. Always a Spartan.”—marked the latest in a string of misses on high-profile recruits for coach Tom Izzo. Meanwhile, it represented a massive coup for Boilermakers coach Matt Painter and a program that has not landed a consensus five-star prospect since 2002, when Rivals.com began publishing recruiting rankings. At 6'9", 270 pounds, Swanigan is a powerful low-post scorer who excels at establishing position near the basket and converting from close range. Those skills helped him average 22.6 points and 13.7 rebounds last season en route to earning Indiana’s Mr. Basketball honor and helping Homestead High in Fort Wayne, Ind., win a state title. In an interview with SI.com in April, Swanigan’s coach at Homestead, Chris Johnson (no relation), commended Swanigan for his high basketball IQ and ability to facilitate for his teammates. “Once he gets it at the 15-to-17-foot range, he sees the floor well and is able to get other people involved,” Johnson said. Painter will need to figure out how to use Swanigan and fellow 7-footers A.J. Hammons and Isaac Haas. Playing all three big men—none of whom are adept three-point shooters—together for long stretches seems like a non-starter. Not only would Purdue’s spacing would be severely compromised, but opponents could also deploy quicker forwards to offset the Boilermakers’ size advantage. Still, few teams will possess the depth to counter what Purdue can unleash in the frontcourt over the course of a full game.